The chemical structure of Kojic acid. The present study was aimed to develop an Aspergillus mutant strain with high ability of KA production using UV irradiation method. Furthermore, the main factors affecting KA biosynthesis by the selected mutant were screened and the related model was evaluated. On the other hand, this research tried to increase KA production by a simple mutation method combined with medium optimization using statistical experimental design. Sucrose, glucose, sodium nitrate (NaNO3), potassium dihydrogen phosphate (KH2PO4), magnesium sulfate heptahydrate (MgSO4·7H2O), potassium chloride (KCl), ferrous sulfate (FeSO4·7H2O), ferric chloride (FeCl3), yeast extract, Sabouraud dextrose broth (SDB), potato dextrose broth (PDB), and KA were supplied by Merck Chemicals (Darmstadt, Germany). Four Aspergillus strains including, A. flavus (PTCC 5004), A. fumigatus (PTCC 5009), A. terreus (PTCC 5283), A. niger (PTCC 5012), and A. oryzae (PTCC 5163) were provided by Persian type culture collection (PTCC, Tehran, Iran). For determination of KA concentration, Bentley's modified method was used based on the complexation of KA with Fe3+ ions and subsequent measurement the absorbance of the produced red complex at 500nm.24 Briefly, 100μL from different concentrations of KA (1–32mg/mL) was transferred to the test tubes containing 900μL of deionized water and 2mL of the freshly prepared FeCl3 (0.06M) in HCl (0.1M) was added. After mixing the reagents with 12mL of deionized water, the absorbance of the mixtures was measured at 500nm using a UV–Vis spectrophotometer (UV-1800, Shimadzu Corporation, Tokyo, Japan). Deionized water was replaced by KA stocks as blank. All of the above-mentioned procedures were repeated three times on three different days and the mean of absorbencies was used for drawing the suitable standard curve. Into 50mL of sterile defined medium consisting glucose (30g/L); NaNO3 (2g/L); KH2PO4 (1g/L); MgSO4·7H2O (0.5g/L); KCl (0.5g/L); and FeSO4·7H2O (0.01g/L) 1mL of spore stock suspension (1×108 spore per mL) of A. flavus, A. fumigatus, A. terreus, A. niger, and A. oryzae was separately added and each 250-mL inoculated Erlenmeyer flask was then incubated in a shaker incubator (30°C, 150rpm) for a period of 30 days. Interval samples (1mL) were consequently withdrawn aseptically each 24h. Fungal cells were then harvested by centrifugation (6000×g, 20min) and the obtained supernatants were used to determine the KA concentrations in the media in comparison with that of the blank (the supernatant obtained from the un-inoculated media) as previously described (see “Determination of KA concentration” section). These experiments were reiterated three times on various days. Screening of mutants with the ability for production of KA was done in 96-well microplates. Firstly, 100μL of UV induced mutant spores (OD600, 0.1) survived from the previous section were separately transferred to wells containing PDB (100μL). After 24h, 48h, and 72h incubation at 30°C, 10μL of ferric chloride solution (1%) were separately added to each well and the absorbance was then measured at 500nm with a Synergy 2 multimode microplate reader (Biotek, USA). The mean of absorbance from three independent tests was used for comparing with the results from cells which did not expose to UV light and selecting the high KA producer mutant.14 The selected mutant was then preserved at −80°C in glycerol (20%) supplemented SDB medium. Thereafter, one mL spore suspension (1×108 spores per mL) obtained from the wild-type cells and the selected mutant was separately cultivated in 250-mL Erlenmeyer flasks containing the defined medium (50mL) with and without shaking (30°C, 30 days) and KA concentration was periodically measured. Applied levels of independent variables in the fractional factorial design. Experimental design and results of the 25−1 FFD augmented to central composite design. In this equation xi (i=1−5) are the variables of the experiment, Y is response function (KA production), e is the error of the experiment, b0 is the constant coefficient, bi (i=1−5) are the linear coefficients, bij (i≠j) are the second-order coefficients, bii (i=1−4) are the second-order interaction coefficients, and x are the independent variables, where in this study independent variables were coded as A, B, C, D, and E. Finally, the predicted model was affirmed for variables applied in the design. Design-Expert version 7.0.0 statistical software was used for analysis of the results. The coefficient of determination, R2 was applied for evaluating the qualities of the fitted model. In addition, analysis of variance (ANOVA) together with the F-test was used for assessing the effects and p≤0.05 was considered as significant. The location of the optimum was estimated by solving the fitted model. Among four tested fungal strains, A. terreus showed the highest level of KA production (2.21g/L, Fig. 2A). The amount of KA produced by A. fumigatus (0.37g/L), A. ostus (0.29g/L), and A. flavus (0.28g/L) was not significantly different from each other (p>0.05). Irradiated samples were grown on PDA for 4 days and sub-cultured in 96-well microplates. The obtained results showed that few variants exhibited more intense deep red color than the wild strain after adding ferric chloride solution (1%). The C4-5, C5-10, C3-20, and C2-40 mutants exposed to UV light for 5min, 10min, 20min, and 40min, respectively were selected as high KA producers (Fig. 2B). Fig. 3 exhibited the time course of KA production by A. terreus and C5-10 mutant cultured in defined media with and without shaking at 30°C. For wild and selected mutant strain the maximum KA production was observed 13 days after the spore inoculation in static incubation condition (2.9g/L and 7.62g/L, respectively). (A) Screening of a high level KA producing Aspergillus strain. Significant values (*) were determined after ANOVA analysis with Dunnett's T3 post hoc test (p-value<0.05). (B) Screening the best mutants of A. terreus after different exposure time to UV light irradiation compared with the wild strain of A. terreus (as a positive control). Significancy (*) was evaluated after ANOVA analysis of the obtained results (p-value<0.05). Significancy of the C5-10 mutant results (□) was also checked in comparison with other groups (C4-5, C3-20, and C2-40, p-value<0.05). Time course study of KA production by wild strain of A. terreus and C5-10 mutant in different culture conditions. Analysis of variance for CCD refined model. To support the hierarchy of the model, X4 and X5 were not eliminated. The calculated F-value (24.9) for the selected model implied that it was significant (Table 3). The related residual vs. predicted response obtained from the final model is illustrated in Fig. 3 from which a nearly constant variance throughout the response range was obvious. The 3-D counter plots were shown in Fig. 4 supported by the selected model. Studentized residuals against predicted response by final quadratic model. Screening of different species of Aspergillus genera to obtain a high level KA producer was previously reported by El-Kady et al.8 among which A. flavus, A. phoenicis, and A. wentii were found to produce 5g/L of KA in submerged fermentation. In another study, Hazzaa et al.2 described about the KA biosynthesis ability of Aspergillus strains including, A. oryzae var. effusus NRC14 (42.0g/L), A. flavus NRC13 (41.0g/L), A. tamarii NRC18 (22.0g/L), and A. parasiticus (17.7g/L). Improvement the KA production ability of A. terreus by random mutagenesis using UV light irradiation (for 5, 10, 20, and 40min) was also performed in this study to get a potent mutant which produce KA higher than its wild strain. The amount of KA produced by C4-5, C3-20, and C2-40 mutants was significantly higher than their wild A. terreus (p<0.05) after 13 days incubation (30°C, 150rpm). Furthermore, it was found that C5-10 was the most potent KA producer mutant (7.62g/L, p<0.05). Similar results were reported by Mohamad et al.3 who observed a 100-fold increase of KA productivity of A. oryzae ATCC 22788 after UV-induced mutagenesis. El-Aziz14 found that the KA yield of the most efficient UV-induced mutant was 120% higher than the wild strain of A. flavus. 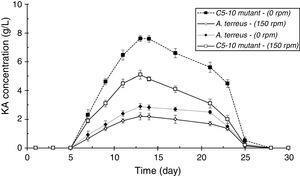 Incubation with shaking significantly reduced the KA production yields by A. terreus and C5-10 mutant (p<0.05, Fig. 5). These results were in contrast with the results reported by El-Aasar1 who observed that both mycelial growth rate and KA production of A. parasiticus decreased in the static fermentation states compared with those of shaking cultures. Response surface graphs of produced KA concentration (A) and (B) constant level of KH2PO4 and yeast extract concentrations at their optimum points, respectively. Analysis of variance of the obtained results in the case of yeast extract (X2) showed that this factor was also significantly affected the KA production by C5-10 mutant (p<0.05) (Table 3). Organic nitrogen sources are generally better than inorganic nitrogen supplements for KA fermentation due to the presence of buffering system, vitamins, and oligoelements.7,27 Beside the peptone and polypeptone, yeast extract has been reported to be a favorable organic nitrogen source for KA production.1,16 However, Kwak and Rhee28 reported a high production yield for KA (83g/L) by A. oryzae using a mixture of yeast extract and (NH4)2SO4 as nitrogen sources. For KH2PO4 (X3) the measured p-value was less than 0.05 (Table 3), so, this factor was also considerably affected the KA production by C5-10 mutant. Rapid KA production was previously observed in the culture broth containing phosphate ranging from 0.55mM to 13.72mM.3,29 On the other hand, Coupland and Niehaus30 reported that production of KA by A. flavus was not influenced by phosphate concentrations in the range of 0.1mM to 100mM. 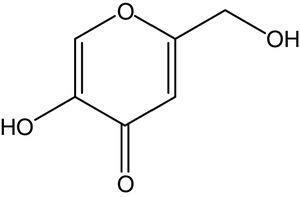 Previous studies confirmed that the optimal pH for biosynthesis of KA by different strain of A. oryzae was ranged from 3 to 6.16,25 Rosfarizan et al.31 considered that the highest KA production achieved at the pH range of 2–3. In another study, it was found that the maximum KA was biosynthesized by A. oryzae var. 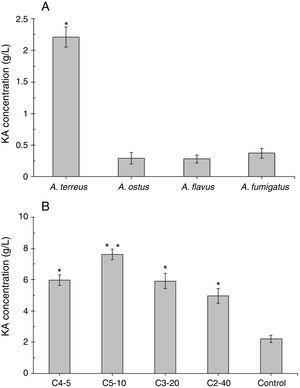 effusus NRC14 and A. flavus NRC13 in a culture medium with initial pH equal to 4.2 Katagiri and Kitahara32 reported that the optimal pH of cultural media (pH 5) for A. oryzae growth was significantly higher than optimal pH for KA production (pH 2.4). However, in the present study the KA production of the mutant strain C5-10 was not significantly affected by pH (X4) and (NH4)2SO4 amount (X5) within the tested levels (Table 3). For fitted model (Eq. 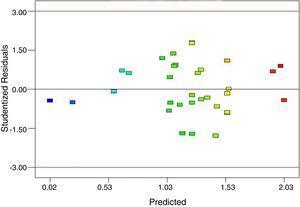 (3)), the measured p-value indicated the significant model with a probability level of 95%. In addition, the significant F-value of the model revealed that there was only 0.01% chance that the “Model F-value” was take place by noise. The relatively high value of R2=0.9475 implied that the model was a significant fitness. Also, “lack of fit F-value” was measured as 0.29 which was not different from the pure error. There is a 97.5% chance that this F-value for lack of fit could occur due to the noise. The predicted R2 (0.7967) was reasonably confirmed by adjusted R2 (0.9095). A desirable signal to noise ratio was confirmed by measured adequate precision (23.2), thus the selected model can be used in the design space. Adequate precision values mentioned above supported the hypothesis that the model equation was sufficient to describe the response of the experimental observations relating to the KA production. The predicted KA concentrations by the selected model are given in Table 2 which exhibited a good agreement between the predicted and experimental data. Furthermore, the optimal level of three effective factors was determined to be 98.4g/L of glucose, 1.0g/L of yeast extract, and 10.3mM of KH2PO4 obtained by alteration the factor levels of the selected model. By replacing these levels in the selected model an optimal amount of 120.2g/L KA was predicted. The suggested optimum medium composition was repeatedly (three times) used for testing the model adequacy. The KA concentration in these three independent experimental tests was 109.0±10g/L which exhibited a suitable agreement with the predicted results. Fig. 4A exhibited the response surface curve for the constant level of KH2PO4 (10.3mM) while glucose and yeast extract were changed within their experimental levels. The minimum response (1.5g/L) occurred when both glucose (50g/L) and yeast extract (0.50g/L) were at their lowest level. 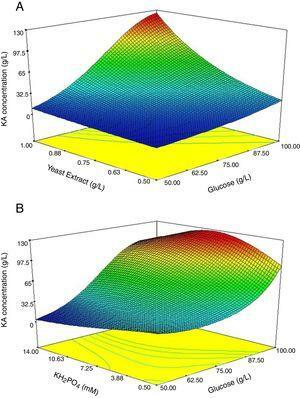 The obtained results showed that in the presence of high level of yeast extract (1g/L) and glucose (100g/L) the maximum level of KA production occurred (Fig. 4A). Furthermore, when glucose was at low or high levels, KA production by C5-10 mutant was not considerably changed at a low level of yeast extract (0.5g/L) (Fig. 4A). Analysis of the response at the different levels of the factors revealed that there is a remarkable interaction between glucose and yeast extract at the optimum level of KH2PO4. At the optimum level of yeast extract (1g/L), minimum response (2.45g/L) was observed with a low level of glucose (50g/L) and high level of KH2PO4 (14mM) (Fig. 4B). When KH2PO4 was at low or high levels, the production of KA by C5-10 mutant was not significantly different at the high level of glucose (p<0.05) (Fig. 4B). Furthermore, biosynthesis of KA by C5-10 mutant in the presence of 0.5mM KH2PO4 was significantly higher than 14mM at a low level of glucose (Fig. 4B). Also, the attained results suggested a considerable interaction between glucose and KH2PO4 at the optimum level of yeast extract. The present research was aimed to produce a mutant strain of A. terreus with high ability for KA biosynthesis using a conventional UV-induced mutagenesis method followed by application of fractional factorial design to optimize culture media components required for KA production. pH and (NH4)2SO4 were established not to be very important factors considering to KA production assisted by the mutant strain of C5-10, while glucose, yeast extract, and KH2PO4 were represented the significant effect on such ability. Finally, the optimum medium composition for biosynthesis of KA by C5-10 mutant was determined as follows; glucose (98.4g/L), yeast extract (1.0g/L), KH2PO4 (10.3mM), initial pH of culture media equal to 2.1, and (NH4)2SO4 (0.82g/L). More than 50-fold overproduction of KA by C5-10 mutant strain of A. terreus was achieved using simple mutagenesis and medium optimization methods. However, further studies must be performed to merit potential application of this strain for large-scale production of KA. This work was financially supported by a grant from Herbal and Traditional Medicines Research Center, Kerman University of Medical Sciences (Kerman, Iran) (95000197). Research reported in this publication was also supported by Elite Researcher Grant Committee under award number  from the National Institutes for Medical Research Development (NIMAD), Tehran, Iran. Application of half-fractional factorial design (H-FFD) and response surface methodology to optimize conditions for lipase production of a newly isolated Pseudomonas sp.